When he was six years old, Dean Miller already knew he wanted to be a marine biologist. At that time, growing up in Australia, the world of marine biology seemed both spectacular and limitless, he said. “I wanted to study the wonders of the Great Barrier Reef, the intricate and complex connections between the thousands of different life-forms that represent the most diverse ecosystem on the planet,” Miller told Truthout. But in the last two years, this has all changed for him. This is because over the last two years, the Great Barrier Reef, which is so dear to Miller and countless others who revel in the beauty and mysteries of the oceans, has been dying off at an unprecedented rate due primarily to warming ocean waters. Coral bleaching occurs when corals become stressed by warmer-than-normal water, causing them to expel symbiotic algae that live in their tissues, from which they get their energy. Coral turns completely white when it bleaches. If it remains bleached long enough, it dies. One scientist has already gone so far as to declare the Great Barrier Reef is now in a “terminal stage.” Most of those studying the reef agree that what is happening is unprecedented. This is because, at a minimum, two-thirds of the 1,400-mile long reef bleached out last year, which led to 22 percent of it dying. Now another bleaching event has resulted in at least two-thirds of the reef bleached again. One crucial thing we do know we’re losing: much of our air. While coral reefs only cover 0.0025 percent of the oceanic floor, they generate half of Earth’s oxygen and absorb nearly one-third of the carbon dioxide generated from burning fossil fuels. A report by the UN’s Food and Agriculture Organization shows that coral reefs are responsible for producing 17 percent of all globally consumed protein, with that ratio being 70 percent or greater in island and coastal countries like those of Micronesia. 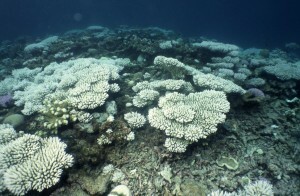 At the time of this writing, Earth has lost nearly half of its coral, and oceanic warming only continues to accelerate. A 2012 study revealed that half of the Great Barrier Reef had already vanished in just the previous 27 years. Two years later, the world’s most qualified coral reef experts released a report showing that, without dramatic intervention, the Great Barrier Reef would disappear completely by 2030. Furthermore, a study published and released by NOAA in 2011 warned that, “unless action is taken now to reduce the threats,” 90 percent of all reefs will be “threatened” by 2030, and all of Earth’s coral reefs could be completely gone by 2050. The study, Reefs at Risk Revisited, listed human-caused climate disruption, warmer water temperatures, ocean acidification, shipping, overfishing, coastal development and agricultural runoff as the contributing factors. Burdick, who described Guam’s reefs as “getting clobbered,” agreed. The coal mine he referred to is looking like it is going to move forward, which will, according to Miller, bring an additional 500 ships carrying coal across the Great Barrier Reef every single year. Truthout interviewed Miller’s colleague, John Rumney, the managing director of Great Barrier Reef Legacy in February, when this year’s bleaching event began. “This coral is in big trouble,” Rumney said at the time. Like Miller, Burdick and Raymundo, Rumney warned of the extreme loss of biodiversity that comes with the disappearance of reefs. The need for independent research on the Great Barrier Reef during this second mass-bleaching event is needed more than ever, according to Miller. His and Rumney’s organization is striving to get more scientists out to the reef as quickly as possible. The world’s oceans are virtually choking on rising greenhouse gases, destroying marine ecosystems and breaking down the food chain — irreversible changes that have not occurred for several million years, a new study says. The changes could have dire consequences for hundreds of millions of people around the globe who rely on oceans for their livelihoods. “It’s as if the Earth has been smoking two packs of cigarettes a day”, said the report’s lead-author Australian marine scientist Professor Ove Hoegh-Guldberg. The Australia-U.S. report published in Science magazine on Friday, studied 10 years of marine research and found that climate change was causing major declines in marine ecosystems. Oceans were rapidly warming and acidifying, water circulation was being altered and dead zones within the ocean depths were expanding, said the report. There has also been a decline in major ocean ecosystems like kelp forests and coral reefs and the marine food chain was breaking down, with fewer and smaller fish and more frequent diseases and pests among marine organisms. “If we continue down this pathway we get into conditions which have no analog to anything we’ve experienced,” said Hoegh-Guldberg, director of the Global Change Institute at The University of Queensland. Hoegh-Guldberg said oceans were the Earth’s “heart and lungs”, producing half of the world’s oxygen and absorbing 30 percent of man-made carbon dioxide. “We are entering a period in which the very ocean services upon which humanity depends are undergoing massive change and in some cases beginning to fail,” said Hoegh-Guldberg. More than 3.5 billion people depend on the ocean for their primary source of food and in 20 years this number could double, the report’s authors say. The world’s climate has remained stable for several thousand years, but climate change in the past 150 years is now forcing organisms to change rapidly — changes that through evolution would normally take a long time, said the report. “We are becoming increasingly certain that the world’s marine ecosystems are approaching tipping points. These tipping points are where change accelerates and causes unrelated impacts on other systems,” said co-author marine scientist John F. Bruno at the University of North Carolina. Last week, the head of the United Nations Environment Program, Achim Steiner, said it was crucial the world responded to the loss of coral reefs, forests and other ecosystems “that generate multi-trillion dollar services that underpin all life-including economic life-on Earth”. Coral reefs, the “rainforests of the sea,” are some of the most biodiverse and productive ecosystems on earth. They occupy only .2% of the ocean, yet are home to a quarter of all marine species: crustaceans, reptiles, seaweeds, bacteria, fungi, and over 4000 species of fish make their home in coral reefs. With an annual global economic value of $375 billion, coral reefs provide food and resources for over 500 million people in 94 countries and territories. But tragically, coral reefs are in crisis. Coral reefs are endangered by natural phenomena such as hurricanes, El Nino, and diseases; local threats including overfishing, destructive fishing techniques, coastal development, pollution, and careless tourism; and the global effects of climate change—warming seas and increasing levels of CO2 in the atmosphere. According to Reefs at Risk Revisited, a recent report by the World Resources Institute (WRI), 75% of the world’s coral reefs are at risk from local and global stresses. Ten percent of coral reefs have already been damaged beyond repair, and if we continue with business as usual, WRI projects that 90% of coral reefs will be in danger by 2030, and all of them by 2050. The symbiotic relationship between corals and zooxanthellae can only exist within the narrow band of environmental conditions found in tropical and subtropical waters. 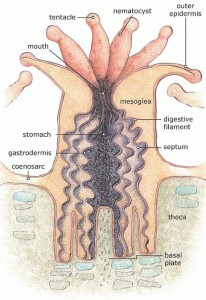 The water must be clear and shallow so that the light algae need for photosynthesis can penetrate, and water temperatures must ideally remain between 23˚ and 29˚ C (77˚ to 84˚ F). The number of coral species in each reef varies: the Great Barrier Reef off Australia has over 500 species of coral while a Caribbean reef has about 50. Today many reefs have 40%-50% less coral than they did just 30 years ago. 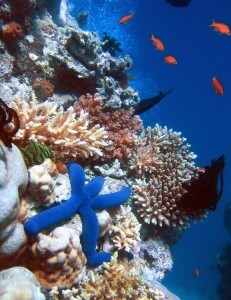 Natural phenomena such as hurricanes or prolonged cold and rainy weather can harm coral reefs. The El Nino weather pattern, which can result in lower sea level, altered salinity due to too much rainfall, and elevated sea-surface temperatures, can also damage coral. When corals become overheated, they react to the stress by expelling their symbiotic zooxanthellae, which results in coral bleaching. 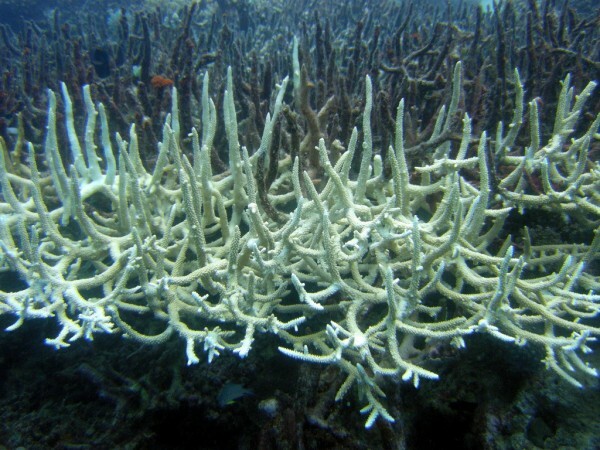 If the bleaching is mild or short-term, corals can recover as algae recolonize, but if the bleaching lasts too long, corals starve to death. Other natural phenomena that stress coral reefs include predators such as parrotfish, barnacles, crabs and crown-of-thorns starfish, and diseases. Of local threats to coral reefs, overfishing and damaging fishing techniques such as deep water trawling and the use of explosives and cyanide, are the most destructive. When herbivorous fish that eat seaweed are overfished, uncontrolled seaweed growth can smother corals. Coastal development results in erosion, and runoff containing the excess sediment can block the light zooxanthellae need. Nutrient-rich fertilizer runoff and sewage effluent can boost algae growth, which starves the water of oxygen, causing eutrophication. Pollution from land, including hot water releases from power plants, pathogens, and trash, and from marine activities, such as fuel leaks and oil spills, also endangers coral reefs. Tourism, while relying on the appeal of coral reefs, can be damaging when careless divers trample on corals or break off pieces as souvenirs. In addition more and more coral and tropical fish are being harvested for the aquarium trade. The global effects of climate change are also having critical impacts on coral reefs, and “the evidence is overwhelming that the ability of corals and the reefs they build to keep pace with the current rate of climate change has been exceeded” according to a recent study. The average temperature of tropical oceans has increased by .7˚ C which, combined with natural fluctuations of warmer ocean temperatures, has resulted in extensive coral bleaching around the globe, involving thousands of square miles of reefs. When El Nino occurred in 1997-1998, widespread and severe coral reef bleaching occurred in the Indo-Pacific region and the Caribbean, killing 16% of the world’s coral reefs in 12 months. The 2010 El Nino has also resulted in massive bleaching around the world. Scientists don’t yet understand the long-term impacts of coral bleaching, but they do know that bleaching leaves corals vulnerable to disease, stunts their growth, and affects their reproduction, while severe bleaching kills them. The 30 million tons of carbon dioxide our oceans absorb every day is changing the chemistry of seawater and increasing acidification. Today, coral reefs are experiencing warmer ocean temperatures and more acidity than they have at any time in the last 400,000 years. Acidification reduces the water’s carrying capacity for calcium carbonate that corals need to build their skeletons. Even a small decrease in the coral’s ability to construct its skeleton can leave it vulnerable to erosion, and research suggests that coral reefs will begin to dissolve if atmospheric carbon dioxide levels double this century. It’s estimated that by 2050, only 15% of coral reefs will have enough calcium carbonate for adequate growth. 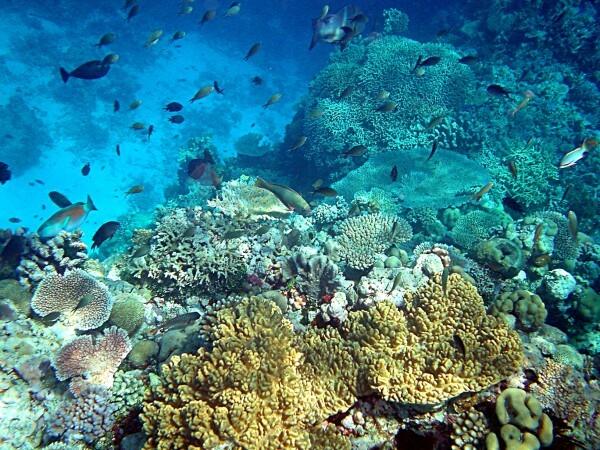 A new study also shows that ocean acidification profoundly alters coral reef ecosystems. As C02 levels rise and acidification increases, the biodiversity of coral reefs drops, resulting in the elimination of key species needed for healthy reef formation. “The decline of the structurally complex corals means the reef will be much simpler and there will be less habitat for the hundreds of thousands of species we associate with today’s coral reefs,” said Katherina Fabricius, a scientist at the Australian Institute of Marine Science. What can be done to save these precious and beautiful ecosystems? Reefs at Risk Revisited calls for the expansion of Marine Protected Areas (MPAs) where fishing and fishing methods are regulated, curbing unsustainable fishing, better management of coastal development, and the reduction of both land and marine-based pollution. It also recommends comprehensive ecosystem management that includes all stakeholders, and stresses the need to invest in scientific research and educate the public about the importance of coral reefs. It’s crucial, of course, for national and international bodies, and for all of us to address the threats of climate change by curbing carbon emissions. The Coral Restoration Foundation protects and restores coral reefs through creating coral nurseries and transplanting corals into degraded reef areas. 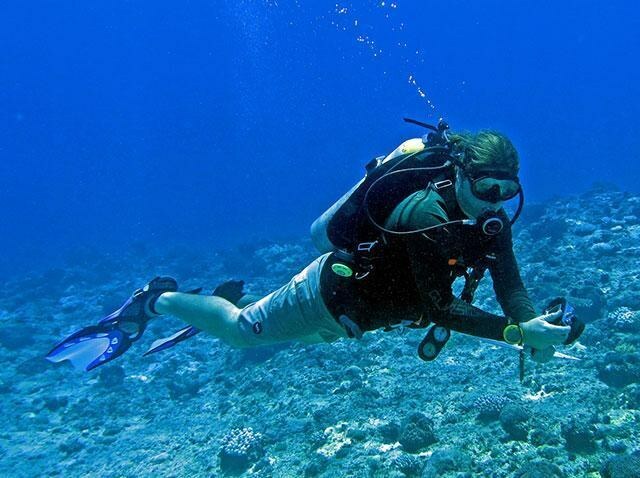 Concerned individuals can adopt a coral through the Coral Restoration Foundation or a coral reef through the Nature Conservancy, which uses the funds to conduct research, promote marine conservation and support the creation of MPAs. MPAs, which are being created worldwide, protect biodiversity and help communities manage resources sustainably. The Great Barrier Reef is the largest and richest coral reef in the world because it has been protected since the early 1970s. The creation of an MPA off St. Lucia in the Caribbean has resulted in a tripling of the fish population. Everyone can help coral reefs by practicing sustainable fishing, and eating only sustainably caught fish. When vacationing near coral reefs, be careful not to touch them and don’t buy souvenirs of coral or other marine species. CERC students who want to learn more about coral reefs can take CERC’s spring break Coral Reef Ecology course in Bermuda in March 2012. It deals with the biology and microbiology of corals, the ecology of coral communities, anthropogenic factors that impact coral reefs, and coral reef restoration and sustainability.